The Microsoft requirements for a Windows Phone device mean there's little variation in terms of controls across the product range. 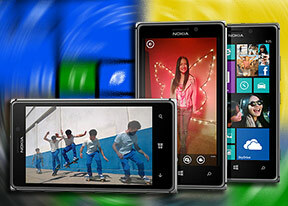 The Nokia Lumia 925 is no exception. It has three capacitive keys below the display - Back, Home and Search. At the bottom of the glass covering the screen is the mic pinhole. Above the screen is the 1.9MP front-facing camera, the ambient light and proximity sensors, and the earpiece. It's the right side of the phone where it gets interesting. Here are the volume rocker, the Power/Lock key and the two-step camera shutter key. They are all made of aluminum and have uniform width, all of them are on the thin side but they project enough to make them easy enough to use. The Power/Lock key can be used to wake up the screen, but you can also do that with a double tap a la Nokia N9 (even the new Asha 501 does this). Another way to unlock the Nokia Lumia 925 is to long press the shutter key. There's an option to either start the stock WP camera or Nokia's custom Smart Camera (which we'll cover later). The top of the phone is quite busy with the microSIM card slot, the microUSB port, 3.5mm audio jack and the secondary mic pinhole. The microSIM card goes in a tray and you need an ejector to open it. There's no microSD card slot here and the Lumia 925 doesn't have a third microphone. The left and bottom sides of the phone are left completely bare. We leave the aluminum side of the Nokia Lumia 925 to get to the polycarbonate back. There's a round lens housing that protrudes slightly - that covers the Carl Zeiss lens with f/2.0 aperture, the Optical Image Stabilization mechanism and the 8.7MP image sensor. To the side of the camera is the dual LED flash that is used as an AF assist light and video light too. The positioning of the camera makes it easier to hold the phone when taking a photo - with phones that have their cameras too close to the top edge you always run the risk of your finger getting in the way. Anyway, further down the back is the loudspeaker grille with a small nub to raise the phone when you place it on the table and keep the loudspeaker from getting muffled. Also around here are the three pogo pins that feed electricity to the phone when you attach the optional wireless charging cover or use certain car docks or another accessory. Hidden below the polycarbonate back of the Nokia Lumia 925 is the 2,000mAh Li-Ion battery. It's the same capacity as the battery of the thicker Lumia 920, but we've seen thinner Androids pack bigger batteries.